DENVER - Armstrong Steel Building Systems is pleased to announce the inaugural contribution endeavor for the launch of Armstrong United, the company’s anticipated philanthropic foundation, with a month long matching gift pledge to the Peyton Manning Children’s Hospital at St. Vincent. Armstrong United will make a contribution to the Peyton Manning Children’s Hospital at St. Vincent for each building that Armstrong Steel sells between April 1 and April 30, 2014. In addition, customers will be asked if they’d like to supplement Armstrong's contribution to the project and Armstrong United will match those donations dollar for dollar. Armstrong United made its initial pledge during an on-air telethon benefitting the Children’s Hospital on April 3, 2014. “One hundred percent of monies raised through the telethon went to the Peyton Manning Children’s Hospital at St. Vincent,” said Sue Anne Gilroy, executive director of the St. Vincent Foundation. The Children's Hospital at St. Vincent offers "pediatric services, state-of-the-art facilities and a friendly atmosphere," according to the hospital's website. Armstrong Steel is no stranger to creative gift giving. Over the Holiday season in 2013, Ethan Chumley directed his executive staff to visit Denver retailers and pay off 100% of any layaway ticket which included at least one children’s toy. “I am always gratified, but never surprised by the willingness of our customers and employees to contribute meaningfully to our philanthropic efforts. Together we achieve remarkable results, and that’s why our commitment to the Peyton Manning Children’s Hospital at St. Vincent is not only a commitment to children, but is a commitment to our customers. Each year, we carefully select partners whose programs meet our common goals. 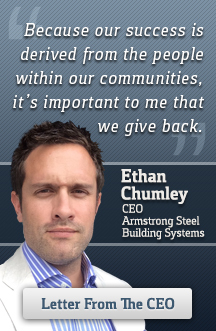 In this day and age, it’s important for a company which has seen the level of success Armstrong has experienced to share that success with important organizations at the foundation level as well as the grassroots level,” says Chumley. In addition to its Customer Matching Donations in the month of April, Armstrong Steel donates to organizations that are important to it’s employees and customers such as the United Way, Project Angel Heart, Habitat for Humanity, Dumb Friends League, The Denver Museum of Nature & Science, the Children’s Diabetes Foundation, the Denver Art Museum, Boys & Girls Clubs of America, the Denver Art Museum, and Boy Scouts of America.